Groundbreakers for the future Ira Reynolds Riverfront Park at Susquehanna Depot included Pennsylvania, Susquehanna County and borough officials, as well as state agency representatives, including (top, from left) Paul MacNosky of DCED, Commissioner Alan Hall, Borough Councilmen Joe Varsik and Roy Williams, Butch Coleman of Endless Mountain Stone, Sen Lisa Baker, Lauren Imgrund of DCNR, Eric Super of DEP and local Boy Scouts. Imgrund (above) was among those to address the crowd. 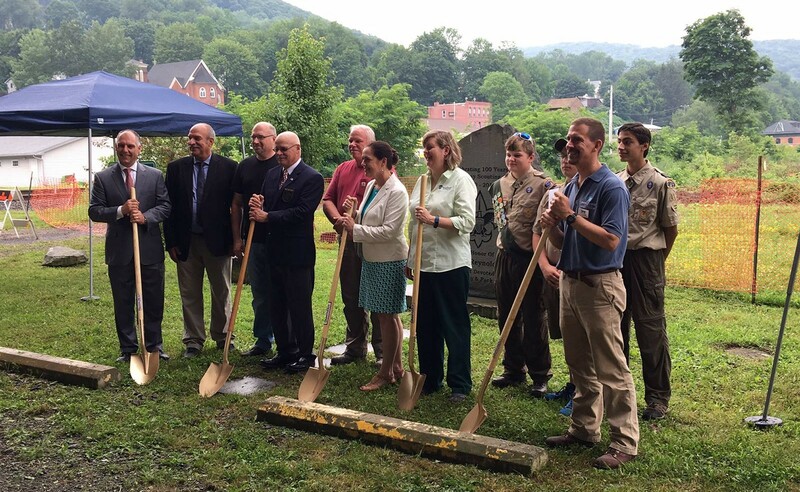 Representatives from PA DCNR, DEP and the DCED met with borough officials and others at Susquehanna Depot on July 13 for a groundbreaking ceremony along the Susquehanna River in advance of the construction of Ira Reynolds Riverfront Park. Borough officials were notified in March that the project had been selected as a “Brownfields to Playfields Project” by an inter-agency task force. Borough residents will soon start to see the environmental cleanup work that will precede the park construction. 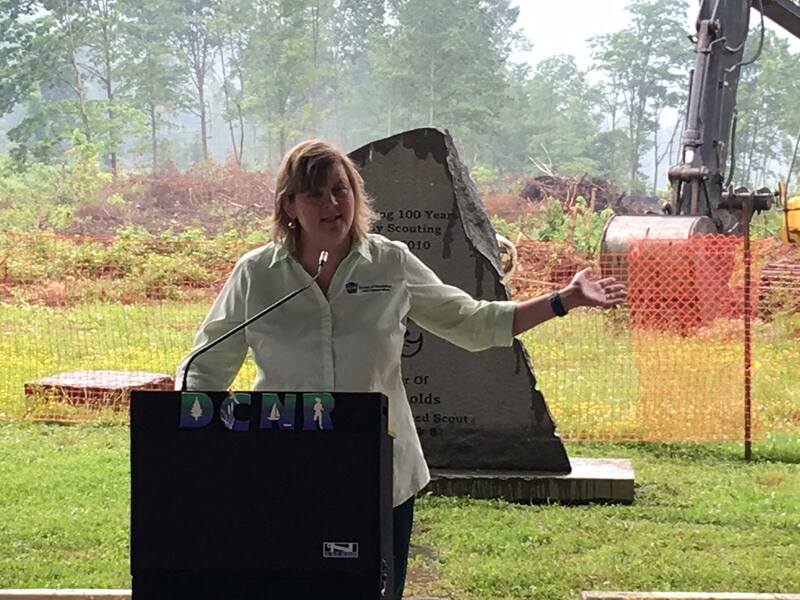 Primary funding will come via a $250,000 DCNR grant. Ira Reynolds Riverfront Park was one of seven selected as part of the program, the others being in Mahanoy, Carlisle, Williamsport, Nanticoke, Charleroi, and Union Township. The Brownfields to Playfields initiative was created to renovate former factory and warehouse sites and other damaged lands for recreational and conservative purposes. The inter-agency approach provides better project coordination by enhancing communication between municipalities and the project funding sources. The task force gauges community support, enthusiasm of local partners, end-use relevancy, and the ability of local coordinators to manage the project. 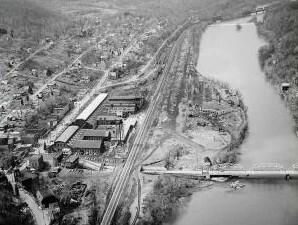 The 14-acre site, which lies between the river and the downtown area, was formerly home to the Erie Railroad yards (below) and, in recent years was deemed a hazardous site due to contaniments left behind as railroad activity to the borough all but ceased. The new park will feature a pavilion, pedestrian trails, lighting, a volleyball court and an ice rink. It is hoped by DCNR and borough officials that the park’s proximity to the Priesthood Restoration Site of the LDS Church will bring visitors into Susquehenna Depot to appreciate its other amenities, as well as the Starrucca Viaduct in nearby Lanesboro. The park’s namesake, Ira Reynolds, was widely known in the region as the “Oldest Boy Scout,” joining the Boy Scouts in his hometown of Luzerne just four years after the national organization had formed. His first Scoutmaster wrote the First Aid section of the original Scouting Handbook. Reynolds’ nine decades of service to Scouting was, perhaps, he greatest legacy. Reynolds started studying electrical engineering at Penn State at the age of 16, enlisted in the US Navy for three years, after which he worked at a tannery in Noxen. It was the Erie Railroad that took him and his young family to Susquehanna Depot, where he worked as an electrician for many years. He died at the age of 108 in November 2010 at the Barnes-Kasson Hospital in Susquehanna Depot.